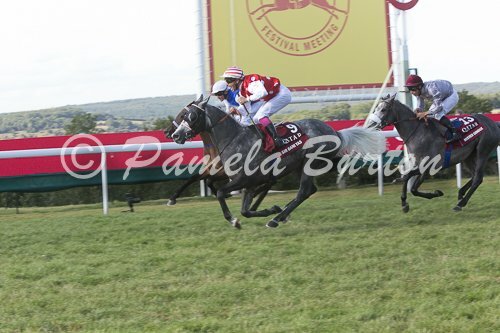 15 June 2016, UK ~ A top rated list of entries was released by the Arabian Racing Organization (ARO) for the first leg of the Doha Triple Crown, the Qatar International Stakes (Gr1PA), to be run as part of the Qatar Goodwood Festival on Saturday, 30 July. Entries are topped by 2016 highest rates Arabian racehorse worldwide, Al Mourtajez, winner of the Qatar Arabian World Cup (Gr1PA). Not to be forgotten is Gazwan rated at 120 and winner over Al Mourtajez in the third leg of the 2015 Series, the (2016) HH Emir’s Sword (Gr1PA). Also among the entries are 2015 Goodwood Festival winner Sir Bani Yas and runner-up Prada T.
The Doha Triple Crown was initiated in 2015. The remaining two races in the triumvirate are the Qatar Arabian World Cup (Gr1PA) to be run at Chantilly in October, and the HH Emir’s Sword (Gr1PA) to be run in Doha in February 2017. This series links together three of the most prestigious international Arabian race events and also carries a $1,000,000 bonus to any horse that wins all three stages. The overall prize fund for the Qatar International Stakes is £400,00, and with £200,000 going to the winner, the one mile contest has attracted 26 entries, of which more than two-thirds carry ratings over 100. The race has a supplementary entry stage on Wednesday 20 July and a final declaration stage on Wednesday 27 July before the day of running on the 30th.